Shapeabilities Rosemal Heart Etched Dies Folk Art Collection by Lene Lok comes as a single die with birds and botanical designs framing an intricate heart shape. Folk Art Collection by Lene Lok is inspired by Norwegian folk art with its flower designs featuring scrollwork and flowing lines to create flowing patterns. Bring these whimsical elements into your next projects. Approximate Size: Heart: 4.00 x 4.50 in. 10.20 x 11.40 cm. Shapeabilities Double Heart Gatefold Etched Dies Timeless Heart Collection by Marisa Job is a set of seven dies that has all the parts of a perfect 5 x 7 in. gatefold card. Beautiful heart designs and a "On Your Wedding Day" sentiment for a stunning wedding card. A must have in your card making collection. Licensed Designer Marisa Job brings sweet floral and heart motifs together to create this Timeless Heart Collection to help add beautiful elements into projects. Spellbinders Shapeabilities cut, deboss, emboss and stencil with a single etched die template. Approximate Size: Wedding Day: 4.65 x 0.60 in. 11.80 x 1.50 cm, Gatefold Design: 2.20 x 4.50 in. 5.60 x 11.40 cm, Gatefold Insert: 2.35 x 4.65 in. 5.90 x 11.80 cm, Gatefold Outline: 2.75 x 4.85 in. 6.90 x 12.30 cm, Card Back Design: 4.70 x 1.65 in. 11.90 x 4.20 cm, Card Back Insert: 4.85 x 1.85 in. 12.30 x 4.70 cm, Card Back: 5.00 x 7.00 in. 12.70 x 17.80 cm. Impression Obsession die featuring hearts, with a Valentine's Day theme. US-made steel die compatible with most table-top die cutting machines. Quality embossing folder that creates a deep and crisp emboss in card stock, paper, vellum, metal foil and many other surfaces to enliven any craft project. 6" x 6" paper pad featuring hearts, flowers, "Love You", "Thank You For All You Do", and more. 2 fabric textured designs, 2 pearlescent designs, 4 spot uv designs, half double sided papers. 200gsm heavyweight cardstock. Tattered Lace Die - Floating in the Air Love Tattered Lace Dies are the most detailed and delicate dies on the market. They are beautifully co-ordinated with a distinctive look and can be standalone or used to complement existing dies in your collection. The Tattered Lace Floating in the Air Love dies features a square border with a sentiment reading You are the Love of my Life' surrounded by hanging hearts'. This die is perfect to add to loved ones for special occasions such as Weddings, Valentines, Anniversaries and Engagements. The cut out design looks great inside of aperture cards, or backed onto coloured cardstock to create a two toned design. Tattered Lace dies have a non-stick coating that allows the card to release without the need for wax paper or tumble dryer sheets. Use with a variety of different card, fabric and materials to create stunning effects for your cards, home decor and scrapbook pages. This die measures approx 3.62" x 3.62". 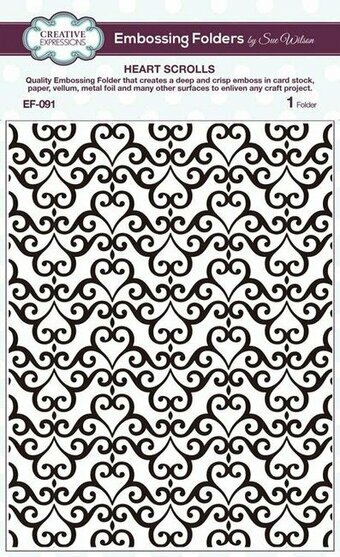 Tattered Lace Die - Heart Border. Detailed and delicate, Tattered Lace Dies are the most intricate dies available. This border die is perfect for use in parchment crafting, and gives you the perfect finishing touch to all of your projects whether you are framing your pictures for a sophisticated finish or adding detail with an intricate border. This die measures approx 21cm x 0.8cm. (8 1/4" x 5/16"). They can also be used on their own to make simple gift tags.